It is becoming more and more popular to make use of larger outdoor spaces for functions and weddings, we specialise in barn decor and draping and have done for a number of years. 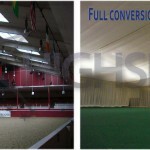 We can completely transform or subtly enhance the look and feel of your barn / ménage. 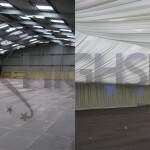 Please see below a couple of examples of our work and do not hesitate to get in contact with us for more information.